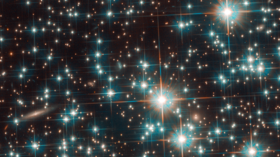 Astronomers attempting to measure the age of a ‘globular cluster’ of stars using the Hubble telescope have discovered a very dim and distant galaxy which may prove to be one of the oldest celestial fossils known to mankind. At roughly a thousand times dimmer than the Milky Way, Bedin 1 is one of the most ancient parts of the known universe yet discovered. The team were studying the temperature and brightness of stars along the outer fringes of our galaxy when they came across the small, old and dim part of space somewhere in the region of 30 million light-years from the Milky Way, making it the most isolated dwarf galaxy yet discovered. Bedin 1 is so old and so distant that it has hardly interacted with any other galaxies meaning it’s essentially “the astronomical equivalent of a living fossil from the early Universe,” according to the Hubble team. It’s estimated to be roughly 13 billion years old based on the properties of its stars, meaning it is almost as old as the universe itself.